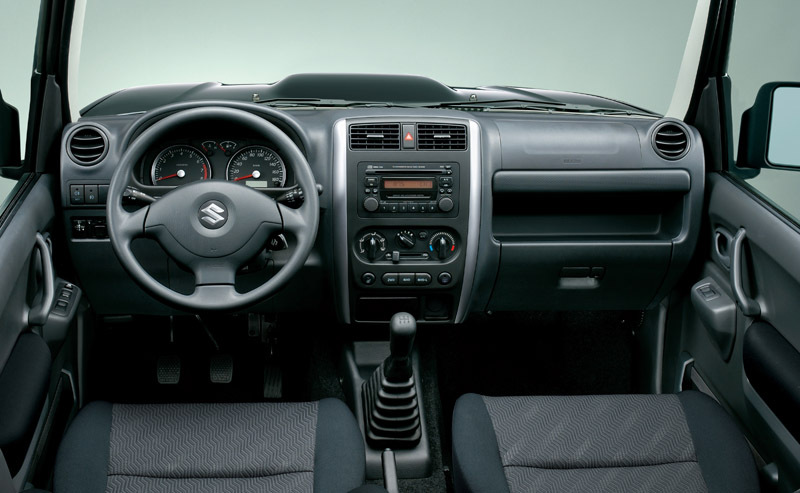 The Jimny is extremely driver friendly. 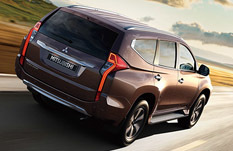 On the road and in the rough, its high-performance features make handling easy for professionals and novices alike. Where you point, the Jimny follows. 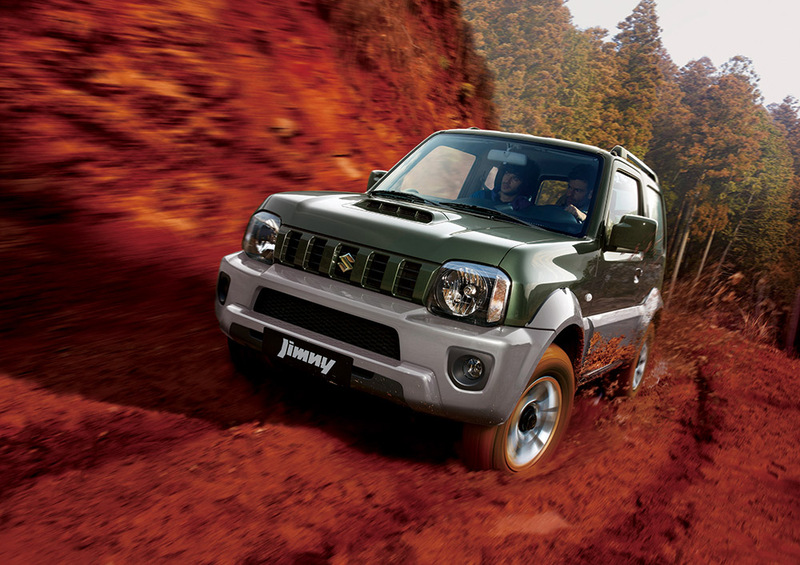 Its power steering provides not only welcome assistance in tight manoeuvres, but helps keep the Jimny tracking true. 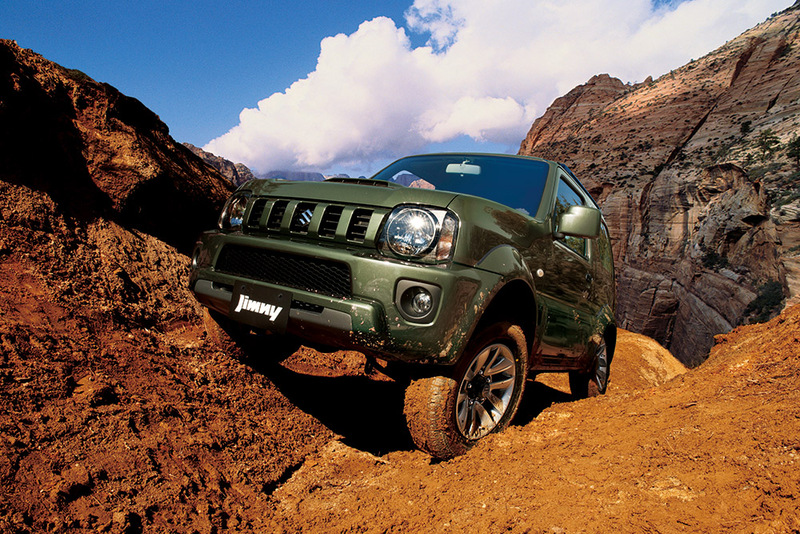 The Jimny stops as smoothly and surely as it goes. High-performance brakes are utilized on all four wheels, and the front disk brakes are of a large diameter for efficient heat dispersion. Since an 8-inch vacuum servo amplifies the force you apply to the brake pedal, little effort is required to bring the Jimny to a halt. 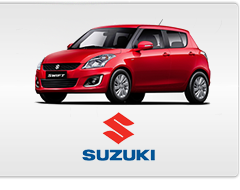 As a safety precaution, Suzuki includes an LSPV (Load Sensing Proportioning Valve) that helps prevent premature locking of the rear wheels during sudden braking and improves braking performance when the vehicle is fully loaded. Compact dimensions also contribute to the Jimny's handling. 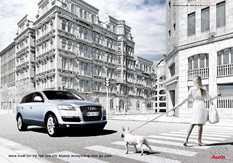 In the city, they help you slip through heavy traffic and into small parking spaces with ease. In the woods, they help you squeeze between boulders and trees. 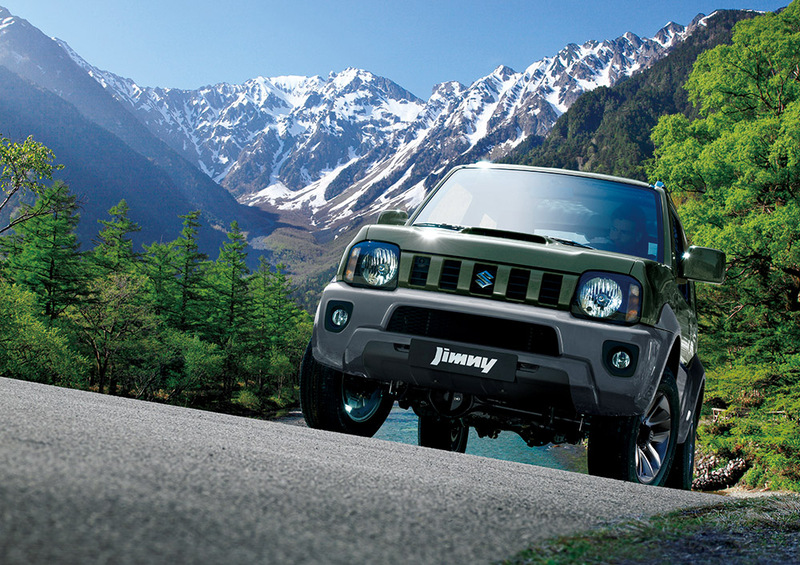 Unbeaten paths that would challenge other vehicles are a breeze in the Jimny. You'll climb hills with confidence thanks to generous approach and departure angles and excellent traction enhanced by radial tyres with universal tread. 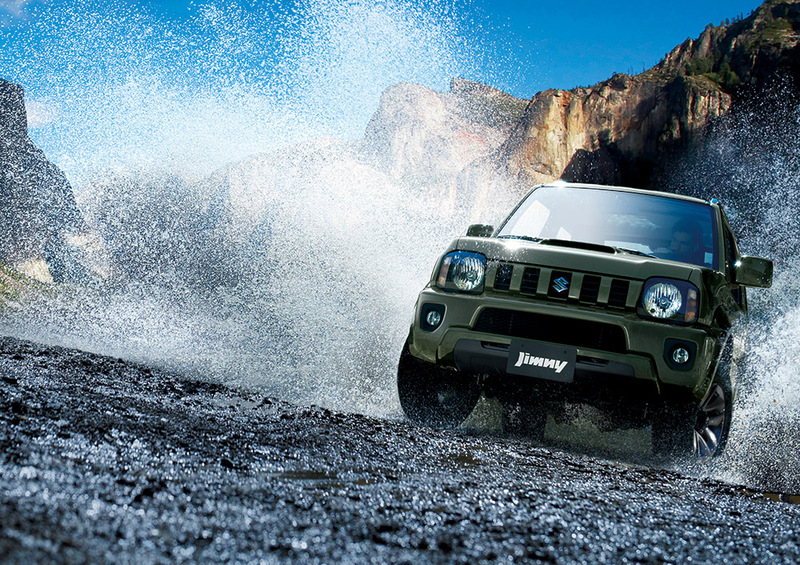 Take the Jimny for a test drive and discover for yourself just how fun driving can be. With the Jimny, proportions based on a long wheelbase and wide treads are combined with big bumpers and big side splash guards for a look of stability and untamed toughness. Plus, simple body contours convey a sense of solidity. A boxy overall shape gives the Jimny a look of serious functionality, but round multireflector headlamps and a vertical-slit grille mean that it also has a distinctive cuteness. The cockpit is designed based on advanced ergonomic studies that helped determine the most natural placement and shape of components. For example, the stress-free driving position keeps you feeling fresh on the longest of journeys. 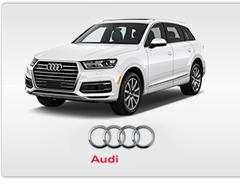 The steering wheel is positioned just right, and its contours feel comfortable in your hands. Cockpit meters are large and clustered together to convey vital information at a glance, so you spend less time reading meters and more time with your eyes on the road. 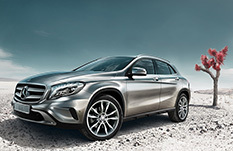 Even the accelerator, brake pedal and ergonomic shift lever offer refined action that enhances your control. Handy power amenities are standard fare on the JLX model. Power door locks and electric windows can be fingertip operated by master controls within easy reach of the driver, and steering is power assisted for easier manoeuvrability. 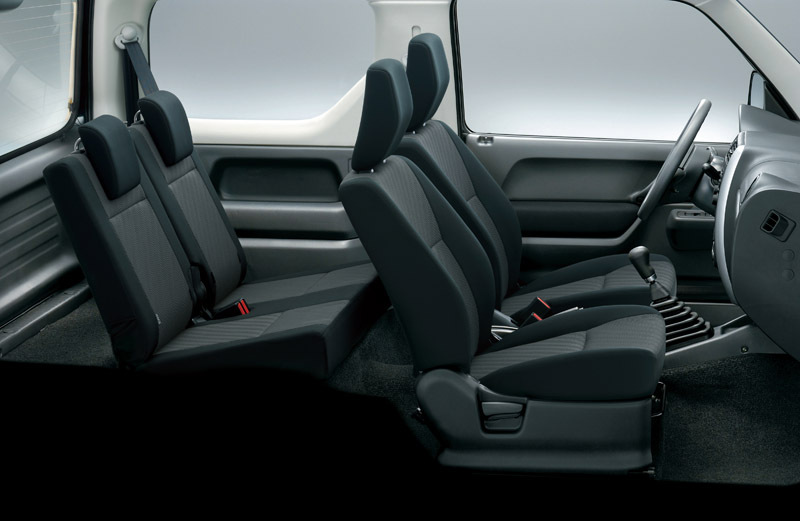 Your comfort is made complete by an optional climate control system that keeps everyone, in all seats, comfortable throughout the year. There are plenty of cars on the road today with 4X4 styling and street-machine souls. 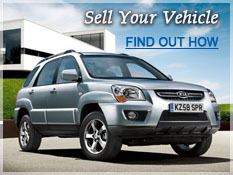 But the Jimny is a genuine cross-country vehicle. The sturdy ladder-type frame is a solid foundation for serious off-road performance. Its rigid three-section design helps stabilise the ride and absorb shock from the road. In combination with eight body mounts, a smooth-running engine, and comprehensive noise-reduction measures, the rigid frame helps make the Jimny as quiet as a family saloon. 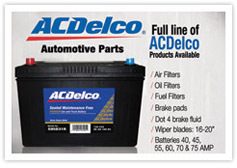 Rigid full-width axles provide a simple yet significant advantage. When one wheel hits a bump, the wheel on the other end of the axle is forced down, increasing surface contact. The result is superior grip on any terrain. The frame floats on a high-performance, three-link coil suspension that handles highway curves and rocky embankments with equal assurance. 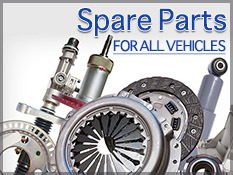 Separate shock absorbers and coil springs increase suspension travel and ensure smoother response. 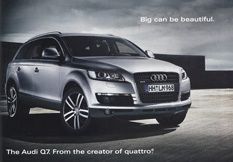 The ride is taut yet compliant, providing a high level of comfort for the driver and all passengers. Safety for Suzuki is priority number one. Of course, putting your mind at ease has the added benefit of making the driving experience more pleasurable. Suzuki's comprehensive approach to driver and passenger protection includes active safety measures that help you avoid accidents. 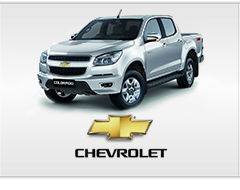 Excellent handling, braking and acceleration give you the power to respond quickly in emergency situations. 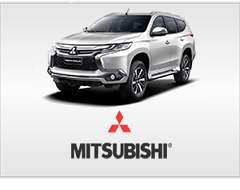 With the optional four-wheel, three-channel, four-sensor anti-lock braking system(ABS), steering control is maintained even during sudden braking. Active safety is heightened by excellent all-around visibility that makes it easier to grasp the surroundings and respond accordingly. Forward visibility is optimised by a large windshield and high eye point, while rearward visibility is made excellent in inclement weather by a rear wiper with demister. The spare tyre is even mounted low on the rear to minimise blocking of the rear view. 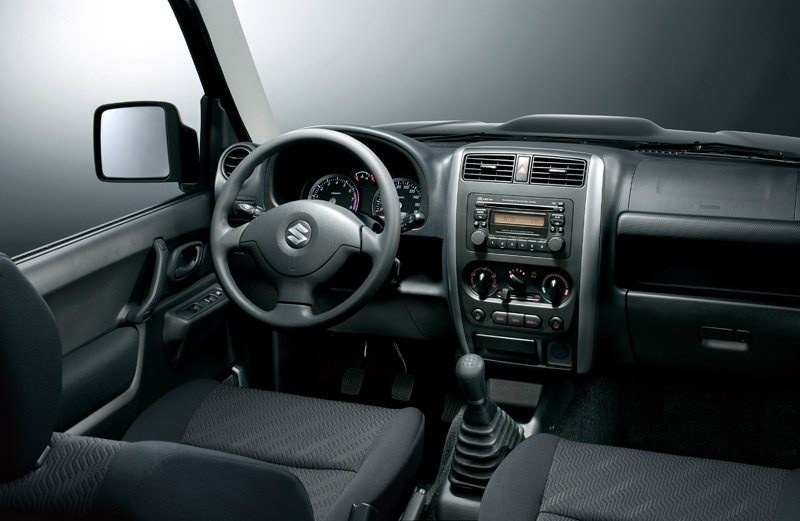 In the event of an accident, the Jimny's passive safety features help protect the driver and passengers. 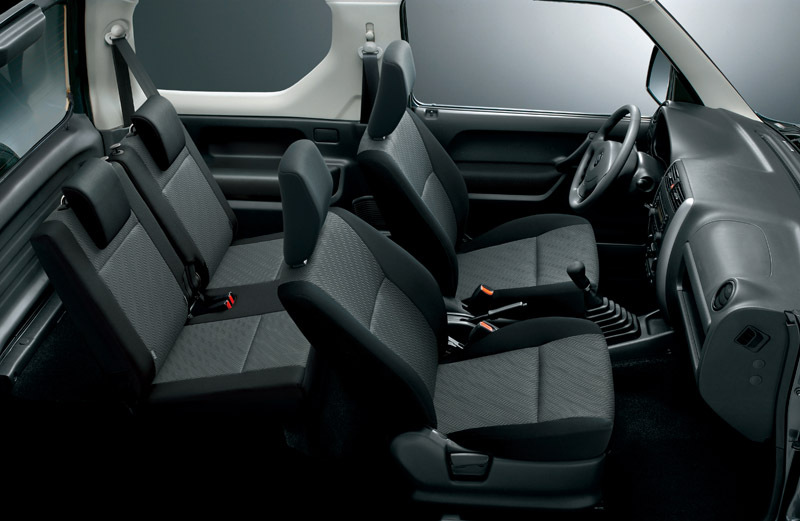 three-point seatbelts are provided on all seats, and the front seats can be equipped with optional supplemental restraint system(SRS) dual airbags and optional seatbelt pretensioners. The body and frame structure were disigned through computer analysis to absorb the force of frontal impact and spread it away from the passengers. Side door beams are also incorporated to help preserve cabin integrity.